Last week, I got the chance to look at the world from a very special perspective: Sitting on the back of a huge elephant and riding through the Nahargarh natural reserve near Jaipur. Did you ever see an elephant without a fence in between and did you stand next to it? It is an amazing feeling, suddenly, I felt so small; I really have respect for these animals. Elephants are known as one of the most intelligent animal species with excellent memory. We started our safari at the gates of the national park. There are two ways to climb on to an elephant’s back: Either you take him by the ears and step on the nose and “walk” along its trunk, as our guide did. Or you take the easier and more convenient way and use the elephant station, where you go up the steps and just take a seat. It is very relaxing to feel the slow steps of this huge animal and at the same time exciting. The way they are moving is gracious, every step seems deliberate. We could hear the tigers roaring in the distance. 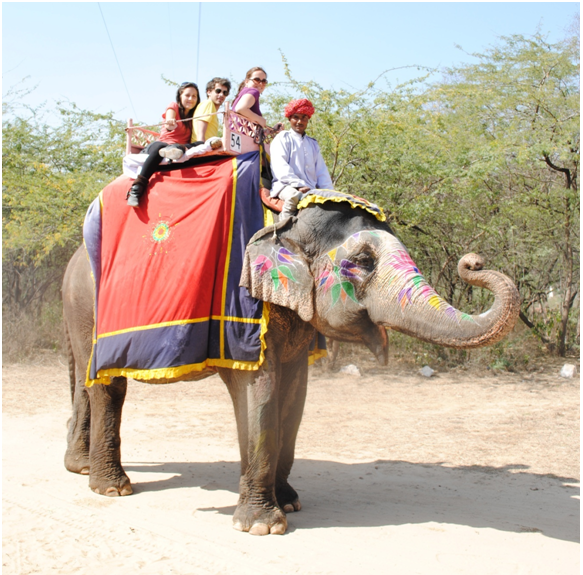 Our guide, an authentic Rajasthani with his red turban and white kurta, was sitting on the neck of the elephant, safely leading down the paths of the park. There must be a very special connection between the animal and this man, as he is able to guide and control this massive creature. The safari leads us through the bush land on gravel paths; all you can hear are the birds, the roaring tigers, the soft unhurried steps of the elephant, as well as its heavy breath. From time to time, it exhales air through the trunk and lifts it towards the sky, like saluting. After the tour, we were able to approach our elephant really closely and stroked the trunk. The skin is warm and rough. It is so amazing to be eyes- on eyes which look as calm and peaceful as his pace. You do not rush these animals – take your time to enjoy this experience that you will remember as long as the elephants do! Contact Shanti Travel for more information on tours in Rajasthan !